Most of us now would be well aware of the lithium exploration explosion underway in the Pilbara, Western Australia, driven primarily by Pilbara Minerals’ (ASX:PLS) discovery of one of the biggest new lithium ore (spodumene) deposits in the world. WA is also home to the world’s largest and highest grade lithium mine at Greenbushes in the south of the state – a lithium mine which delivers about one third of global lithium supply. Whilst most of the current wave of Australian lithium exploration has been in Western Australia, one tiny $6M capped explorer has made the under explored Northern Territory its hunting ground... and initial results are encouraging, especially if you consider how Greenbushes lithium potential was discovered. 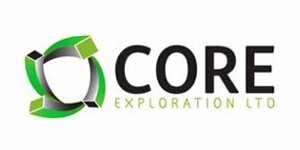 Core Exploration (ASX:CXO) has turned its attention to lithium at the Finniss Lithium Project and the Anningie Lithium Project in the Northern Territory, where the company has granted tenements and applications covering 2500 square kilometres . CXO’s current focus is a number of large scale lithium pegmatite targets defined at the Finniss Lithium Project. 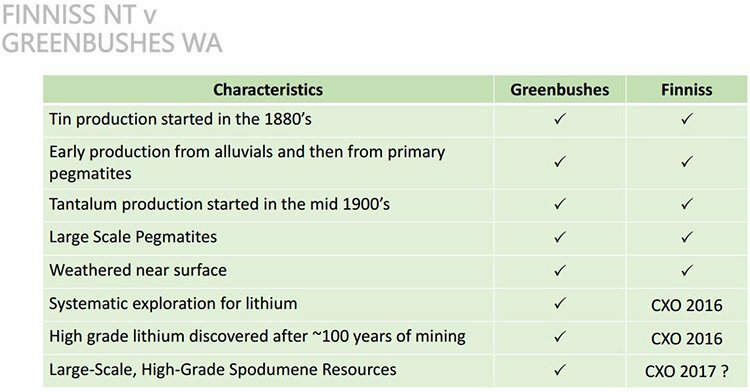 The Greenbushes lithium success story came after decades of mining for tin and tantalum in the area, with deeper drilling leading to the discovery of economic lithium quantities. The pegmatites at Greenbushes are very weathered near the surface, so it’s not as easy to get to the lithium from scratching the surface. These leading indicators for lithium at Greenbushes are also present at CXO’s Top End lithium project, however there is one final piece necessary for a successful discovery that CXO still need to do. Drilling is the primary tool for proving lithium grade and developing lithium resources – and that is what CXO is set out to do. Whilst it is very early days here, CXO is hoping it can repeat some of the WA success in lithium exploration experienced at Greenbushes or Pilgangoora, given the geologic similarities the company is identifying in the NT. Remember this is a tiny company, and it is still very early here, but if it can capitalise on the lithium rich pegmatites in the region, CXO could quickly catch up to the WA lithium explorers in terms of market cap, and that would be many multiples of CXO’s current $6M market cap. Of course there is still a lot of work to do, and there is no guarantee of success here – so seek professional financial advice if considering this stock for your portfolio. Up until now, similar lithium potential in the Northern Territory to that found in WA seems to have been overlooked by budding ASX explorers – but CXO has recognised the Top End’s vast potential and 100 year pegmatite mining history. CXO has around $2.5m in cash reserves to be used on drilling which will begin in the coming months. CXO has begun mapping and sampling at Finniss and has already lodged a drill application with the regulator. Back in May its initial sampling identified spodumene and other lithium minerals with lithium grades up to 0.8% Li 2 O. Keep in mind that lithium is virtually absent in weathered pegmatite at surface at Greenbushes, and that as per Greenbushes, CXO’s current surface exploration is useful in locating pegmatites, but drilling is the primary tool for discovering high grade lithium. CXO’s results to date confirm the enriched lithium content within the Finniss Lithium Project and drilling will test the grades of lithium and spodumene in the unweathered pegmatites at depth. 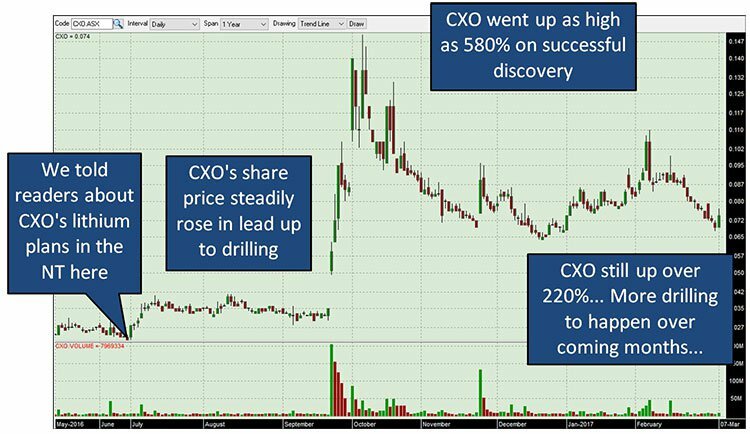 CXO is quietly confident about its new lithium acquisition and hopes to quick step to the next phase of its exploration. 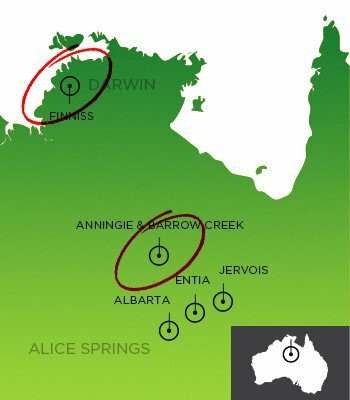 Core Exploration (ASX:CXO) recently identified a number of large scale lithium pegmatite targets at its 100% owned Finniss Lithium Project in the Northern Territory, similar to that seen at Greenbushes. Surface exploration useful in locating and ranking pegmatites – but drilling is the primary tool for proving lithium grade and developing lithium resources . Evidence suggests that the Finniss pegmatites are enriched in lithium and one of CXO’s new pegmatites is at least 1500m long and 450m wide (and could be up to 2000m long). The scale of its prospect is directly comparable to the scale of pegmatites hosting large resources in the Pilgangoora Region in Western Australia. However, Finniss is just one part of CXO’s NT wider play which also includes the Arunta Pegmatite Province and the Bynoe Tin-Tantalum Lithium Field. The Finniss Lithium project includes the Mount Finniss Tin Tantalum Mine along with 25 historic tin tantalum pegmatite mines in the lithium rich Bynoe pegmatite field – remember that tin and tantalum mining also took place at Greenbushes prior to lithium discoveries. Mining in the Bynoe Fields has been ongoing since the 1880s and was most popular in the mid-1900s when a number of tin-tantalum pegmatites in the region were mined. It’s well known by geologists that tin and tantalum are pathfinders that can lead to lithium, so this already gives some strong clues that CXO may be able to unlock some lithium value here. Bynoe is one of the most prospective areas for lithium in the NT, with similarities to Greenbushes, one of the world’s leading spodumene deposits and the largest hard rock lithium mine in the world. CXO recently extended its lithium focus into this region in the highly prospective Bynoe pegmatite field and is hoping to raise its market cap to similar heights of Australian ASX lithium players who have grown substantially over the past few years. 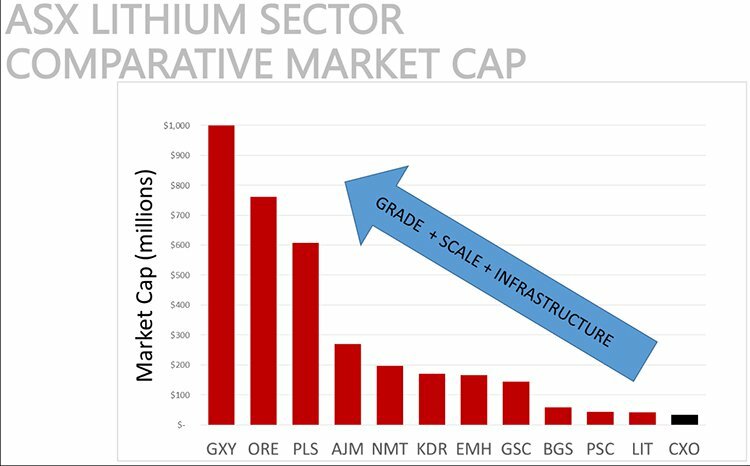 CXO appears somewhat undervalued when you compare the rise of other lithium explorers. But with drilling to come, this may change soon. Let’s have a look at Finniss in more detail. The Finniss Lithium Project covers a large section of the Bynoe Tin-Tantalum-Pegmatite Field. It is not just the scale and previous regional results that put a positive spin on this project, it is existing infrastructure as well. Due to previous activity in the region, substantial infrastructure exists close to CXO’s Finniss Lithium Project including grid power, gas and rail services and is within easy trucking distance (20km) by sealed roads to Darwin Port, Australia’s nearest port to Asia. Should the project one day make it to production, significant cost and time savings could result, including economic shipping potential to the lithium hungry Asian market. 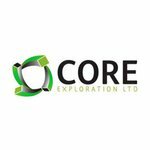 CXO’s exploration study has confirmed the sampling suggesting that the new Zola Pegmatite in the area is at least 1,500m long and 450m wide, as a conservative estimate. The Zola Pegmatite Prospect (CXO 100% ELA31126), as you can see on the map above, includes a north-south trending system of pegmatites covering an area conservatively estimated at between 1-2 km 2 . One of the most crucial characteristics of Zola is the scale. CXO’s Zola Pegmatite is unusually large by world standards and represents an outstanding exploration target for lithium. In fact the scale of CXO’s Zola Pegmatite discovery has been compared to the world class deposits at Pilgangoora in WA . The comparison to Altura Mining (ASX:AJM) in the picture above is important and highlights the potential upside for CXO should the resource at Finniss prove to be truly comparable to that of AJM’s Pilgangoora Lithium Project . AJM holds a 35.7Mt @ 1.05% and trades on the ASX with a market cap of $200m. CXO by comparison has a current market cap of only $6m. The upside is there for all to see and CXO is working hard to make sure the comparison becomes more of a reality – starting with drilling in the coming months. At the same time, as we mentioned earlier, it is early days here and CXO has some way to go to prove up anything substantial in the ground, so apply caution when considering this stock for your portfolio. Previous trench sampling at Finniss back in the 1980s confirmed an unusually large pegmatite with anomalous tin tantalum chemistry. Back then, Union Oil and JV partner Kakadu excavated a total of seven costeans over approximately 1000m (costean is the process by which miners seek to discover metallic lodes) across the pegmatite zone. 203 channel samples were collected over intervals of 5m and analysed. Results indicate highly anomalous levels of tin, tantalum and rare earth minerals. Twenty years later rock chips were taken by Haddington in 2006, with results indicating highly anomalous, but “patchy” Sn, Ta and Li levels. CXO’s Bynoe Pegmatite Field includes a further 25 historic tin tantalum pegmatite mines where sampling is underway. Initial lithium assays of up to 7589ppm (O.8%) Li 2 O were recorded in the first rock chip results and many of the samples assayed at Finniss were above 1000ppm. Remember that lithium is virtually absent in weathered pegmatite at surface at Greenbushes – the largest and highest grade lithium mine in the world. CXO’s current surface exploration is directed toward locating and characterising pegmatites, but drilling is the primary tool for discovering high grade lithium, and that is what CXO will be doing in the coming months. The results at the Mt Finniss Mine complement CXO’s other prospect, the Anningie Lithium Project located in the North Arunta Pegmatite Province, NT. Lithium minerals spodumene, elbaite and lepidodite have been recorded in pegmatites from the Anningie Field. However no modern exploration for lithium has been conducted in the area... until CXO arrived. Detailed mapping and sampling is currently underway to test lithium grades for drilling potential. Every project needs funding and in April this year CXO instigated an oversubscribed placement for $2.2 million . The money is being used to fully fund the exploration and drilling programs set to begin in Q3 2016 on the Finniss Lithium Project. Currently with around $2.5m in cash reserves CXO will unlikely need any capital raising anytime soon – at least not before the upcoming drilling. With the ducks lined up in a row, CXO could see its fruit start to ripen early in the second half of the year as it seeks to unlock the potential of some highly prospective lithium projects. As demand for high energy storage increases, so too will the demand for the key raw ingredient in lithium-ion batteries, that are used to power our modern smartphones, tablets, laptops and electric cars. Tesla is without doubt one of the major drivers in the demand for lithium-ion batteries with their electric vehicles. Hence the automaker is proactively securing long term supplies of lithium to ensure that production. With greener energy electric vehicles set to take increasing market share from their polluting petrol predecessors the need for raw materials such as lithium will rise with it, which has led investment bank Goldman Sachs to call lithium “ the new gasoline ”. 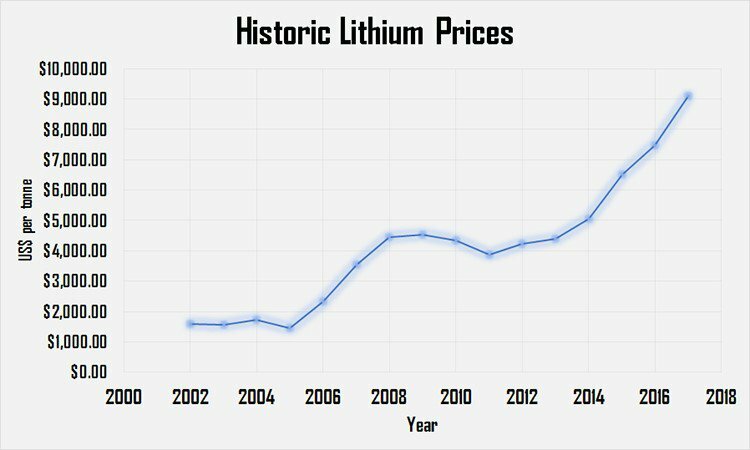 We’ve all heard tales of how people struck it rich by finding oil or how empires such as the Rockefeller’s were built on oil... well what if our generations story to be told is how people who invested in lithium before the big EV push made it big? With Germany set to mandate all cars to be emission-free by 2030 , the country hopes to sell 500,000 EVs by 2030 with the government offering subsidies and incentives to fuel the change to a cleaner mode of transport. Fellow European nation Norway is taking it one step further and seeks to ban the sale of gasoline powered cars by 2025 and now the road’s minister in India calling for the world’s second most populated country to have 100% of vehicles on the road by 2030 to be electric. Can you imagine the 1.25 billion people in India having to use electric vehicles? Sure, not everyone drives a car in India but for even 1% of the population to buy an EV would mean sales of over 1,000,000 vehicles. 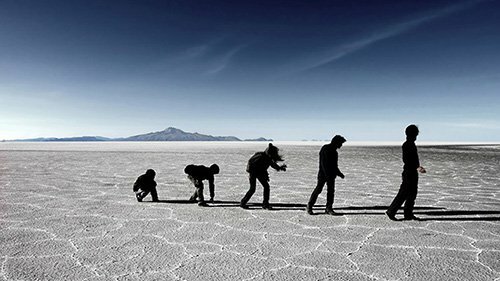 The scramble for companies to secure a lithium supply going forward has only begun. As the price of the metal continues to increase, we will likely see lithium dependent businesses sign up contracts to lock in prices, further increasing demand for the metal whist taking supply away from the market. With the precedent for a move to EVs already having been set with the push for a global carbon tax, a move to cleaner transportation is the most logical step. With public pressure to move to greener energy sources other nations could follow suit and either incentivise the industry or consumers to move towards EVs or bring in legislation forcing people to move to cleaner energy sources. Through joint ventures, acquisitions and new tenement applications in highly prospective regions in the Northern Territory and South Australia, CXO has built a strong strategic holding to propel the company forward. Further to CXO’s Finniss Lithium Project and Anningie and Barrow Creek Pegmatite Fields in the Northern Territory, the company holds multiple exploration licenses throughout SA and NT with copper, base metals and uranium potential. Due to the market sector for lithium heating up and given the future growth potential, it would appear to be the feasible choice in generating greater returns for CXO and its shareholders. However should one of these other resources held by CXO become highly sought after the company could be in a position to leverage its assets to the given market trends. With BHP and Rio Tinto both announcing plans to target copper through joint ventures with junior explorers (like CXO), we could see these licenses held become more active in the near future. The $2.5m in the bank sees CXO funded to begin its planned drilling and exploration programs with the first drilling campaign set to begin early in the next quarter. Drilling will take place at CXO’s Finniss Project, focussing on its high priority pegmatite targets, along with assay results from sampling at the Mt Finniss Mine due to come. So, the market will likely be receiving multiple announcements from CXO’s progress whilst at the same time the broader demand for lithium is set to increase rapidly. Should results from the drilling campaign come back positive and point toward the potential of a commercial lithium resource, we could see the $6M capped CXO receive a rapid re-rate that could see it catch up to the WA lithium explorers. This is of course speculation at this stage, so don’t take this is a guarantee and seek professional financial advice if considering this stock for your portfolio. With multi-nationals who rely on lithium-ion batteries in their products now actively seeking guaranteed supply of lithium, any substantial find by CXO is likely to put them on the radar. Governments passing legislation to make EVs mandatory in the near future is another bullish sign set to drive up demand for lithium for the next few decades. With the right sized lithium resource as hinted with the Zola Pegmatite and with the market demand growing for lithium, CXO could be in the early stages of something much larger.